Still keeping Blair's signature head-band and plaided skirt I throw on my favourite high neckline top from H&M, I think the top compliments the skirt and head-band perfectly since the colour scheme stays in the deep velvet to a suede chocolate tone. Also there is just something about a higher neckline (not necessarily a turtle neck) that is just so flatering and looks amazing on many women's figure and gives an elegant touch on any outfit. And I am so happy that high necklines are back in stores after reportedly being un present for the past 10 years. 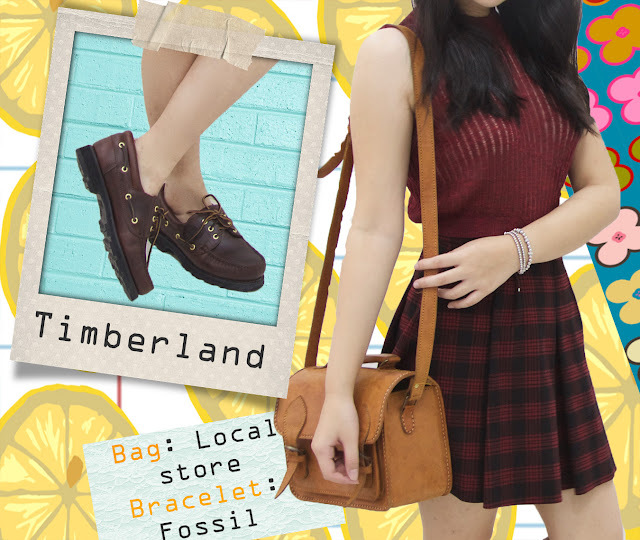 Now you'd probably already get the feeling and aroma of a school girl kind of outfit, to embrace that school girl uniform look I add in a very classic piece that I believe is the center of attention, if you guessed shoes then you are correct my friend, the shoes I am wearing is from Timberland and according to the colour periodic table it is shade 30 in the brown section. I love the accents in the shoes with the threaded suede lace and bronze hardware it screams Gossip Girl or Manhattan as I would like to refer it as to. Then we got the bag. I use this bag almost everyday just because of it's huge about of space and colour. I love warmer colour bags because I tend to use lot of cooler tone times so with the warmer colour the bag brings it just balance out my outfit pretty nice. A little fun fact, bags like mine are called satchel bags and they are created in the year 1906 specifically for mail man or woman, but now it has become of the most fashion revolutionary items. I think this is the last of today's post! see you very soon!